Howdy all!!! I am still full of Turkey…we grew our own this year, and it was so darned good I’ll never buy store bought again!!! Sorry Mrs. Zacky…. Anyway, hope everyone had an exceptionally good Thanksgiving, and with that comes a query and I thought you would like to be a part of the decision process. 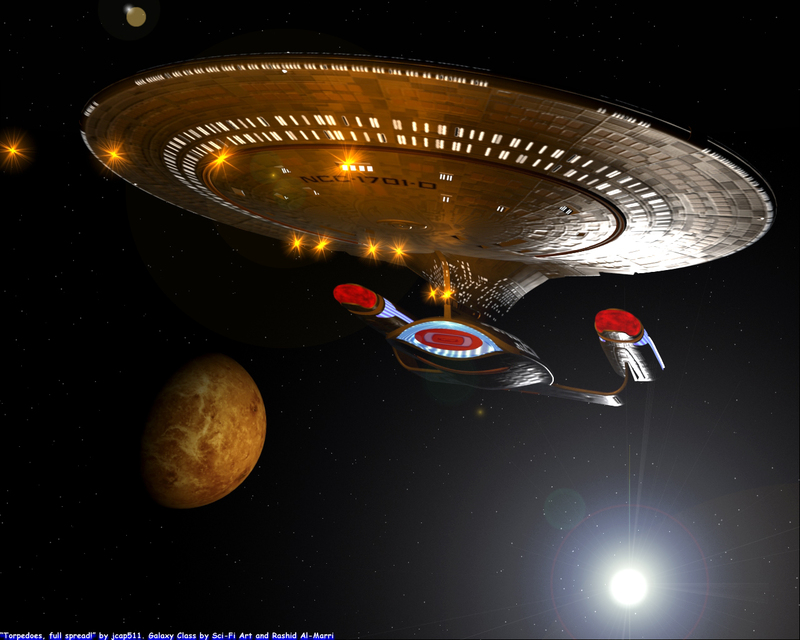 EFX Collectibles are gearing up for the next set of display models, and Bryan Ono asked me what I thought would better, the Enterprise D, designed by the brilliant Andrew Probert, or the Enterprise E that came from my ol’ drawing board!!! Tough choice, I said, and suggested that we have a poll taken here to see what I am sure would be a good consensus. I would love a big model of the E for my office, but I would like a big D also, so I am basically useless as a decider on this one. So here it is for your comments and votes. Let me now what you’re thinking, and I’ll pass on the news to Bryan and Barry. Here is the link to one of my very first blog posts way back in March that has one of EFX’s first collectible pieces…they do some mighty fine work, and way down below is the link to their main page. 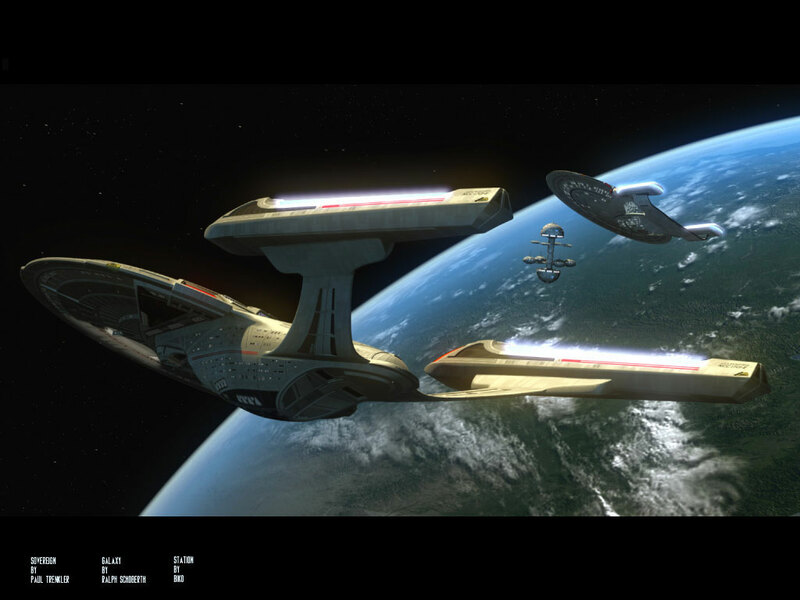 Have fun, and here is even more fun from some of the CG modelers over at Sci fi Meshes. This was my first introduction to garage kits in CG, and I so wanted an opportunity to post some. These are two awesome images of the E by Biko and the D by Jcap511. Unbelievable talent here, as well as of what I am seeing from many of you here on the blog!!! Below are links to their pages, so be sure to check em out…hey, if you also want to include any links to your own or some great CG you’ve seen of these two babies around the internet, feel free to include ’em with your notes. OK, Ok!! 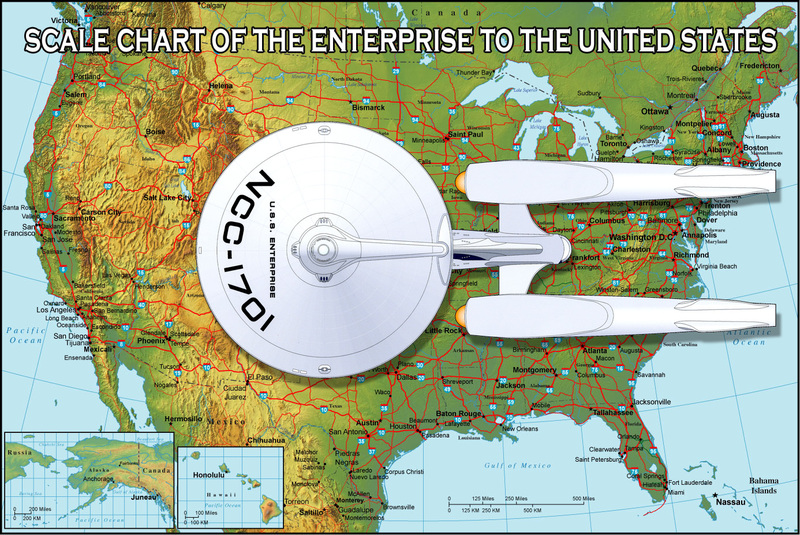 here is the real size of the Enterprise in comparison with the U.S. Man!!!! Yesterday’s post fired up a lot of heat, so hopefully this in-office joke will cool down all of the fire and make you chuckle a little instead. 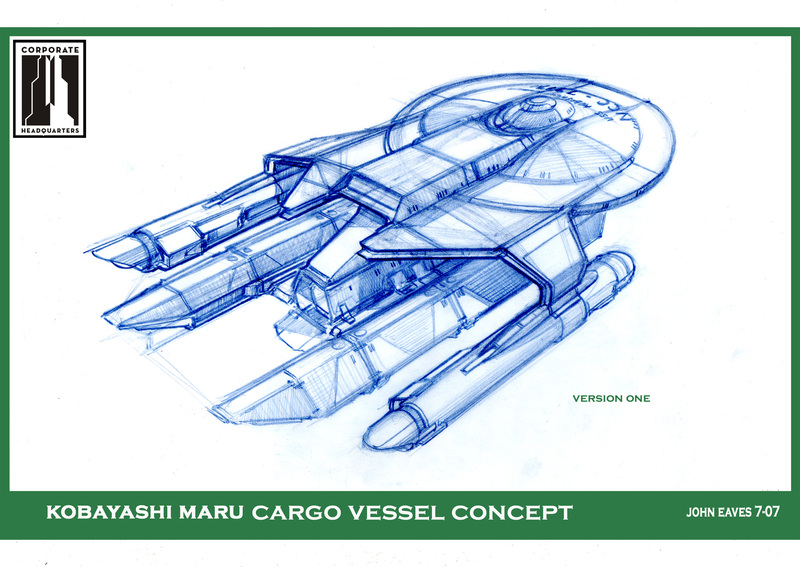 The ship was going through a lot of size changes in the middle of production, and at one time it was close to a mile long, so for a quick laugh in the art department, this little drawing was created. I told you all it was big!!!! But no one would believe me!!! Well, here is the proof right off of the new DVD and out the KING, Alex Jeager’s, mouth…2379.75. So all the arguing can now stop, and all you garage kit modelers can get to work! WOW!! If you picked up the new Star Trek DVD or the art of book, you have really got some amazing and incredible images, concepts & grand imagination laid out in print, The movie versions on DVD and Blue Ray are incredible and are presented in spectacular clarity with some awesome behind the scenes segments. Amazing that all those years of work can be held in practically the palm of your hand. I have all ready watched the movie, and the behind the production stuff is incredible and the book is just as impressive!! Great fun recollecting those early days of applying to work on the show. I had talked to the art directors on the show several times and after about a month of this it looked fairly certain I was going to have to let this one go,,, Then one day months later I got a call from Christine who was one of the art department Assistants and asked if would like to interview with the Production designer Scott Chambliss??? 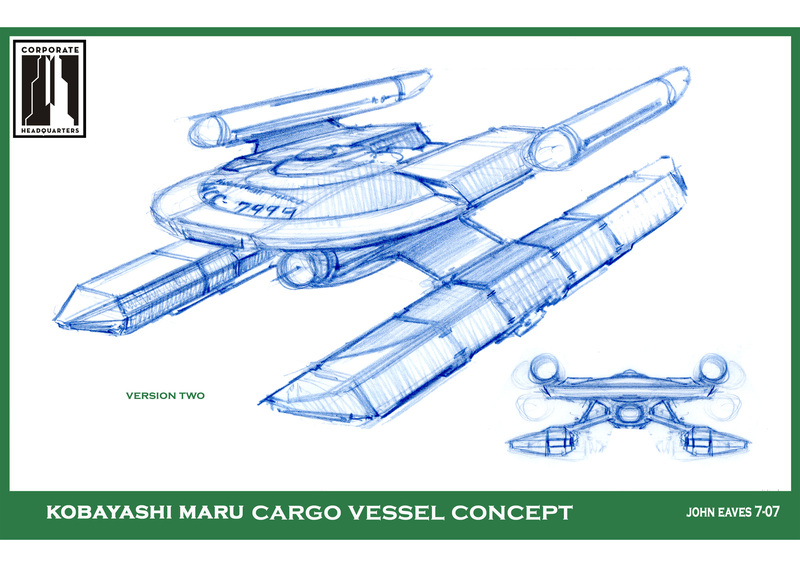 Why of coarse I would, I had to put a quick book of work together for him to see, so I used rejected images from past films and shows, as well as some of the Perpetual spacecraft designs instead of recognizable Star Trek concepts. I thought if I showed Trek work that was a little off the beaten path, it might help get me a job on a show that openly banned folks that had worked on the prior films and shows!!! It worked, and I am very thankful That Scott Chambliss broke the rules and brought me on!!! One of the first things he asked me was: Will you be influenced by what you’ve done before or can you move on into a new direction??? I could tell it was a big gamble for him to bring me on and he put me on a two week trial basis. fortunately I passed the test and stayed on for about 5 months. It was one awesome adventure, and I got to work with an incredible crew, many of which I had great admiration for. Scott had me put a lot of those portfolio drawings on the wall as a sort of basis or stepping off point for where we were heading in terms of aesthetics and new architecture. once we started drawing though those images looked more out of place as the new look of the film was developing. When we sent our discs of art over to Titan to be used for the art book, there was little to no explanation except by the headings attached to the drawings so it was quite fun to see the illustrations that least belonged to anything printed in the art of!!! HAAA! 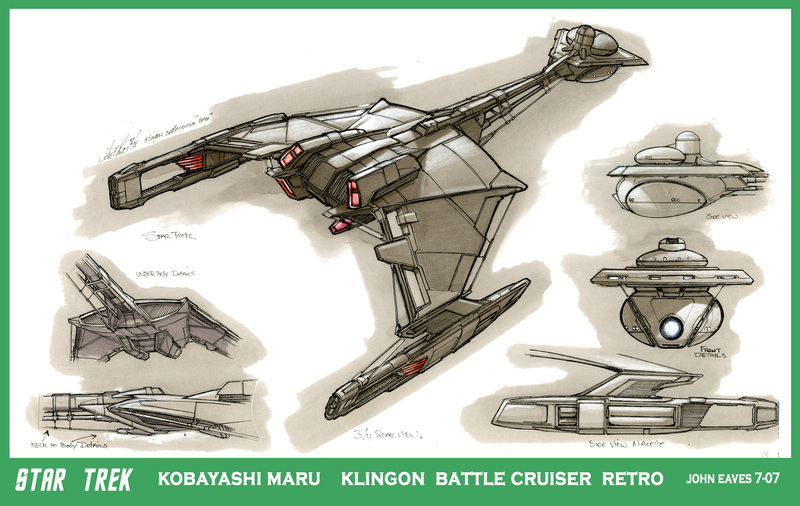 They were more finished pieces and in color while my illustrations for the job was more in lines of concept only and not finished production art. I was brought on the film several months after the art department had started, and the amount of work already conceived by James Clyne and Ryan Church was staggering!! For a short while, Nathan Schroeder was on board, and for a short time you had three of the greatest motion picture artists together on one show!!! The talent was incredible and everywhere. Scott had assembled the finest art department I had ever seen…such an awesome privilege to be a part of such a fun ride. Scott approached things very differently than most of the designers I had worked with before. 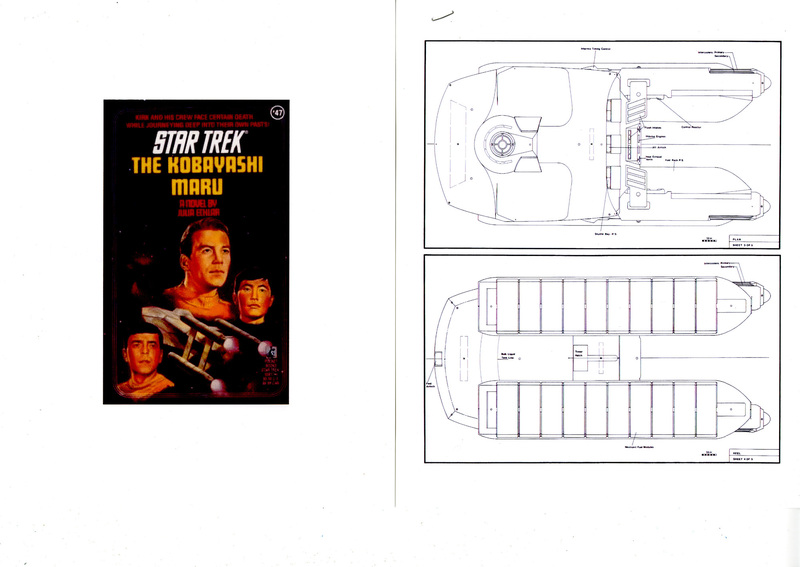 Usually when your boss asks you to design a future tank, he’ll give you old tank references to build from. 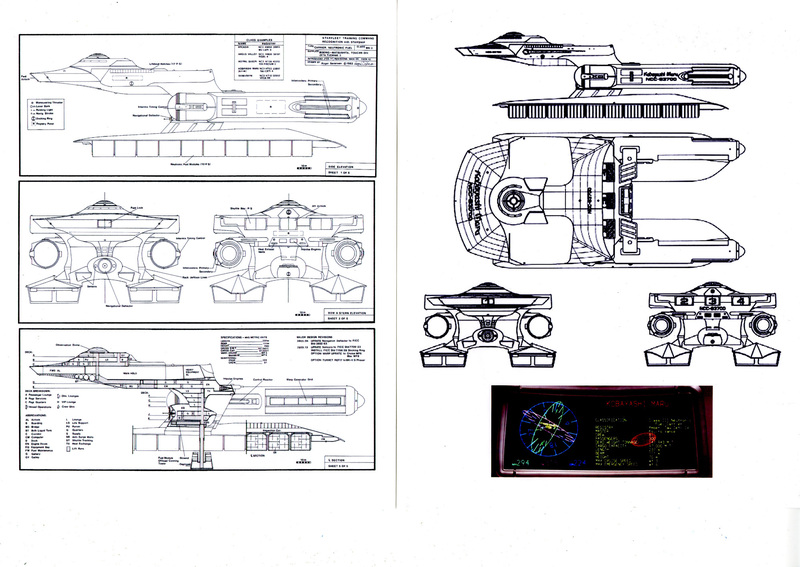 When scott asked me to start working on the med-evac shuttles, he gave me pictures of stylized furniture…… One very creative mind, he has, and he spoke his ideas very clearly with the unusual reference material and in the end made for some very unique and right on the mark concepts. 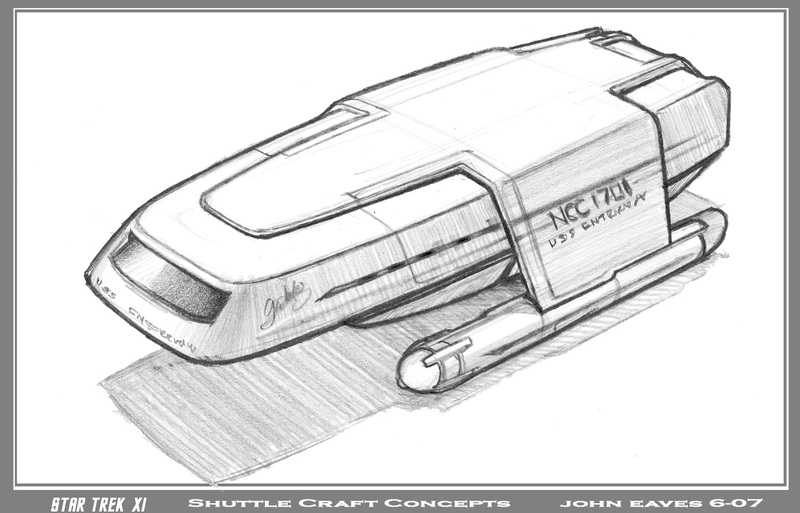 Below is the shuttle sketch based on the table image and the first drawing I did for the show. Scott would have me working on several projects at the same time, always keeping my busy, and one of the cross over projects was an Iowa police cruiser. 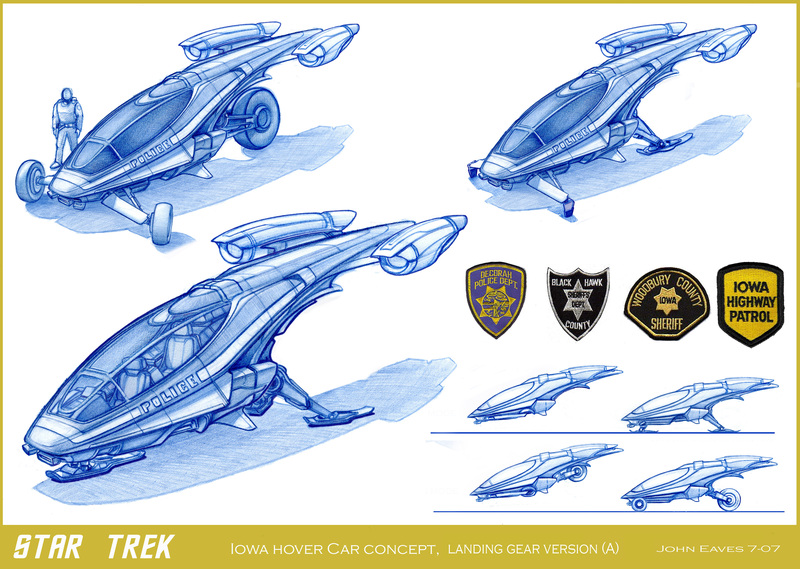 Below are the first passes of those flying squad cars, and in time this would turn into the flying motorcycle. Been way too busy to be current on the blog and also to have a moment to respond to all the fun notes this week. I will do so tonight, but in the meantime, here is a new one of the ever lovely Miss Amanda. We did this Trek shoot in the heat of summer, and this is one of about 7 favorites shots from that morning. Enjoy and catch up with everything and everyone later. my fav of miss Amanda! !